Dr Klaus Toepfer (former director of UNEP) came to visit Kitengela and was so delighted that he decided to donate some money from his own Projects Funds. 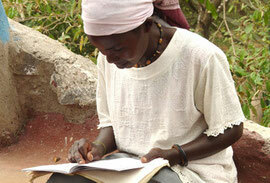 Nani decided that the most urgent need was Masai womens literacy. 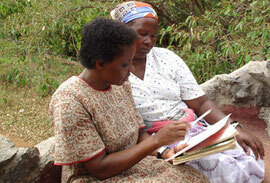 Often some of the young mothers would turn up and need help in reading a document, a report from the schools for their children, financial issues or a bank account. They were helpless and often victims of deceptions and theft. Masai Girls had little opportunity to go to school, as they get married off early and then look after cattle and children. In conjunction with the Mbagathi Steiner School (see notes about Nanis Waldorf School) Kitengela Glass set up a Masai Womens Literacy Class Project. Every Saturday at 2 o'clock, two teachers from Steiner School walk across the river and prepare the lesson in the mosaic caterpillar staff house meeting room. Then sometimes more, sometimes less, women and the occasional man turn up and enjoy the alphabet. As it involves singing and dancing the lessons are very popular.